Craig Denton feels his squad will maintain their focus. Craig Denton says the competition for places in the Worksop team should keep complacency from the door in the NCEL Premier title run-in. His Tigers sit top of the table with five games remaining, having won a remarkable 15 times in a row. Ahead of Saturday’s visit to Sandy Lane of bottom side Harrogate Railway Athletic, Denton said he had a strong squad to pick from. “We’re looking quite strong, we’ve got no injuries or suspensions,” he said. “If you’re midtable or not doing very well, you always get a few injuries, a couple of lads unavailable with work or holidays. “But it’s funny, we’re at the top of the league, going really strong and everyone is available. The leaders have got into a winning habit and Denton is keen for it to remain that way, without his players simply turning up and expecting to roll over teams. That’s where squad depth helps. “You get stuck in a rut, although don’t get me wrong it’s a good rut to get stuck in, winning games. “But we’ve got a handful players who have been in and around this league for quite a long time and played higher as well and they understand that you’ve got to maintain your high standards. “If not, any team on this league can beat anyone. “We’ve got a lot of players, they know that if someone doesn’t perform, they’ll be replaced by someone on the bench or someone not making the squad. “They don’t want to get their shirts away coming up to the end of the season, especially when we look like we’re in a really strong position to win the league. Saturday’s visitors have lost eight of their last 10 games and are without a point in the last month. But that doesn’t mean they can’t give the Tigers a torrid afternoon, Denton insists. 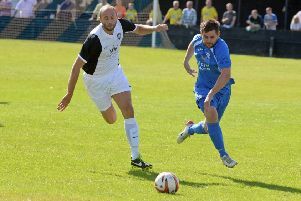 “We played Harrogate back end of last month, it was a midweek game and they put us under a lot of pressure. “They fight for absolutely everything from the first whistle to the last. “We’ve got to show them lots of respect, they’ll want to come and get the points and teams want to stop our run.